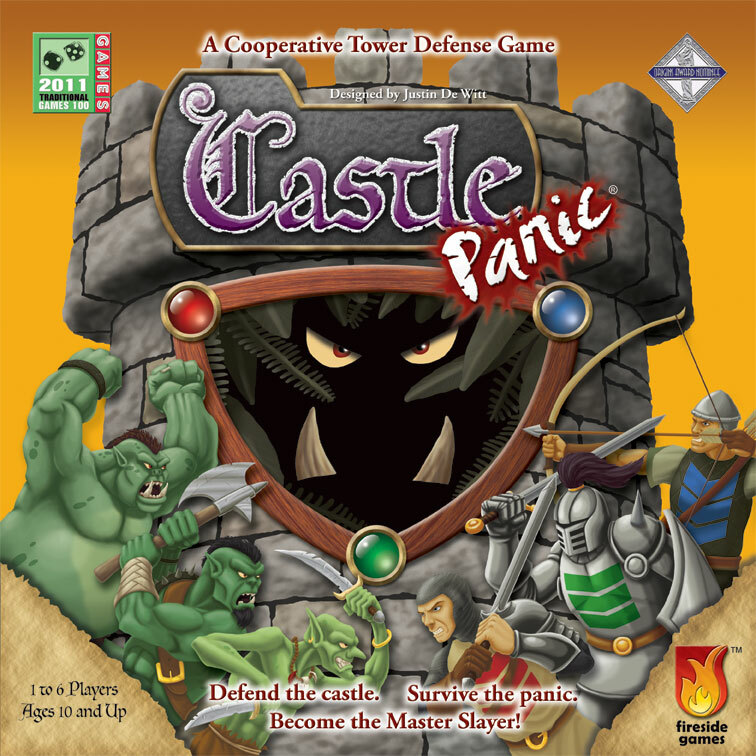 Castle Panic is a game by Justin De Witt, published by Fireside Games. It is for 1-6 players. In this game, players will be trying to defend their castle from a forest full of monsters such as goblins, orcs and even trolls. They’ll have to work together if they hope to withstand the onslaught. Of course their compatriots will be trying to garner the most points as they destroy wave after wave of vicious monsters. The player that can rack up the most points while keeping at least 1 castle tower standing will be declared the winner. This game can be played in several different ways. However for this review, I will be referring to the standard method of play. For the rules and overview of all the other modes of play, please check the rulebook. To begin, the board should be placed in the middle of the play area. All of the walls and towers should be placed on a plastic stand. Towers should be placed on each of the light colored spaces in the castle ring of the board, while walls should be placed on the lines between the Castle ring and the Swordsman ring on the board. 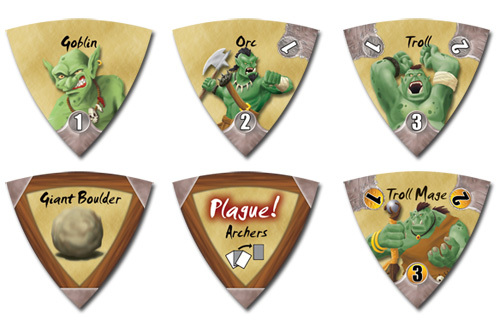 3 Goblin, 2 Orc and 1 Troll token are placed on the board in the Archer ring. These are placed one per arc with the highest number on the token pointed toward the Castle. 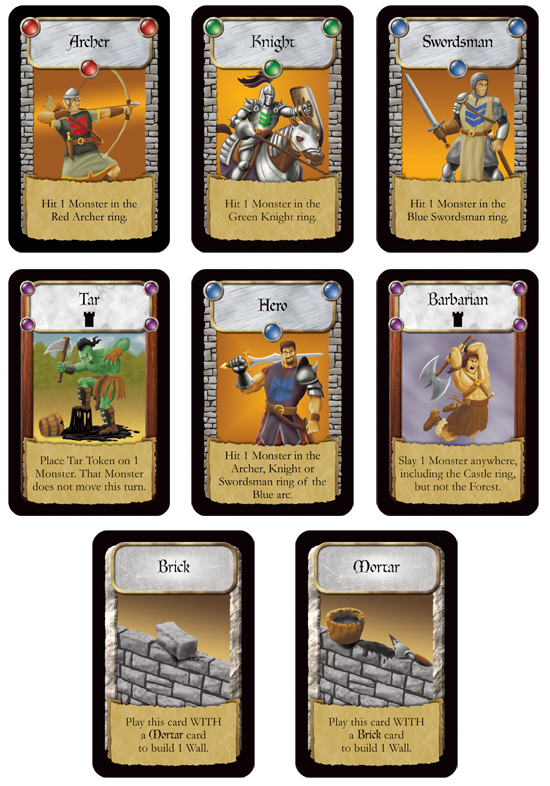 Tokens are placed randomly or as chosen by the players. The remaining monster tokens are placed face down on the table and mixed up into a pile near the board. The Order of Play cards are removed from the other Castle cards and each player is given 1 of these. Any remaining Order of Play cards are returned to the box. The Castle cards are shuffled together. Each player is then dealt a number of cards based on the number of players. The remaining Castle cards are placed face down near the board. The Tar and Fortify tokens are placed near the board as well. The first player is chosen and play now begins. The game is played over a series of turns. Each player’s turn is broken up into 6 phases; draw up, discard and draw 1 card, trade cards, play cards, move monsters and draw 2 new monsters. The first phase is to draw up. What this means is that the player will draw back up to a full hand of cards. That number is set at the beginning of the game based on the number of players. The next phase is to discard and draw 1 card. In this phase the player is allowed to discard a single card if they wish to and draw a new card to replace it with. Of course this is optional and the player doesn’t have to do it if they don’t want to. Next is the trade cards phase. This phase is also optional. In this phase the player is allowed to trade a number cards with another player. That number is dependant on the number of players in the game. The fourth phase is to play cards. In this phase the player can play as many cards from their hand as they’d like. Cards like the Archer, Knight and Swordsman can be used to attack monsters in the corresponding ring. Each time a monster is hit it takes a point of damage which is shown by rotating the monster token clockwise to the next lowest number pointing towards the castle. If the monster loses it’s last hit point, it’s slain. The player that hit it last takes the monster token as a trophy. The Barbarian card can slay a monster in any space on the board. Likewise a warrior that hits a monster can be enhanced with the Nice Shot card to slay the hit monster. Cards like Tar, Fortify Wall, Drive Him Back and Missing can be used to slow the monsters down. Tar places a tar token on the monster which forces it to not be able to move on the move monsters phase or during the draw 2 new monsters phase either. Fortify Wall places a fortify token on a wall making it stronger. If a wall is hit the monster takes a damage point but normally would remove the wall. If a fortify token is placed, the token is removed instead of the wall making the monster have to hit it again before the wall is removed. Players can play a Brick and Mortar card to rebuild a destroyed wall. Drive Him Back moves the monster back to the forest. Missing allows the player to skip the draw 2 new monsters phase. The player can also play cards like draw 2 cards or scavenge to get more cards into their hand. Draw 2 cards does just that. It allows the player to draw 2 new cards from the deck and add them to their hand to be used during their current turn. Scavenge allows the player to search through the discard pile and add a card from the pile to their hand to be used during their current turn also. Once a player has played all the cards they would like, play moves to the fifth phase. The fifth phase is the move monsters phase. In this phase any remaining monsters that were not destroyed during the previous phase are moved 1 space closer to the castle. If the monster moves from the Swordsman ring to the Castle ring and there’s a wall present, the monster takes a point of damage and the wall is removed. If there is no wall, the monster simply moves into the Castle ring. If a tower is present, it is destroyed and removed while the monster takes a point of damage. The monster then takes the place where the tower was previously. Each consecutive move monsters phase will then move the monster clockwise inside the Castle ring, destroying towers till either all the towers have been destroyed or the monster is slain. Only cards with a castle symbol on them are able to affect monsters inside the Castle ring. Towers can not be rebuilt and if the last tower is destroyed, the players lose the game. The last phase is to draw 2 new monsters. In this phase the player draws 2 new tokens from the pile and flips them over face up one at a time. A goblin, orc or troll is placed in the forest by rolling the die and placing the token in the ring that matches the number rolled. The token is placed with the highest number facing the castle. Special monster tokens like the boss monsters or monster effect tokens have their own set of rules for each. For more information on these, please check the rule book. Once the player has resolved the 2 monster tokens, play passes to the next player in turn order. The game continues until one of two things happen. If the last tower is destroyed by the monsters, the game ends and all the players have lost. If all the monster tokens have been played and all the monsters slain, the players win. Players then add up the number of victory points from the trophies they’ve won for slaying monsters. The player that has the most points is the winner and receives the title of Master Slayer. This is a really great looking game. There’s a really great fantasy theme integrated into the game. Each pieces really fits that theme extremely well. There are lots of cardboard tokens from the walls, towers and fortification tokens to the tar and monster tokens. I love the look once the walls and towers are put into place. You really get that epic tower defense feel. The cards are equally good quality and the artwork on these is really great too. Even the board fulfills the theme as well with this forest like castle look and feel. The game even comes with some handy dandy order of play cards for reference. I absolutely love how great this game looks. There’s lots to like with this game. About the only thing that might be missing is a bag to hold all the monster tokens. Really think it’d be easier to deal with the monster tokens if a bag were included to hold them all with instead of having to shuffle things around face down on the table. Not a major deal and definitely not one that I’m complaining about, just the only thing I can think of that could make the game even better. Overall, the game is thematically brilliant and looks fantastic. The rulebook for this game is equally great. There’s lots of really great looking pictures throughout the book. Everything is explained really well including step by step instructions on the Order of Play. There’s a great section where more details are given about the various phases. Also included are some great examples of play including pictures for reference. Awesome! The book also has rules for the other 2 modes of play, co-op and overlord, as well as various optional rules to add more or less panic to the game. There’s even instructions to play the game solo and for a scenario entitled giant boulder. The back page of the book has a great summary of various items including the order of play as well as cards, monsters and monster effects. Overall the book looks great. It’s easy to read through and understand. Nothing to complain about here. This game is an absolute joy to play. I love the tower defense feel that this game provides. It’s kinda like playing Plants vs Zombies on my tablet. You really have to think where you can best take out the monsters as they approach. Of course you’ll probably lose a wall here and there and even a tower or two, but you just have to prioritize what’s important. The game can be a bit difficult for the solo player but I really like the challenge that the game provides. It’s like a giant puzzle and finding the best fit. Playing with more players make things a bit easier but the game still provides a great challenge. I don’t exactly care for the Master Slayer aspect of the game. My thought is that if you all win, you all win. If you lose, you all lose. Period. No need for an alpha gamer situation to arise. In any event, the game is really easy to teach. My kids really enjoyed playing this one. It teaches cooperation which is something that we all need to learn a little more of. Fans of any of the other Panic style games should really enjoy this one, especially if they like the fantasy genre. Solo gamers will like this one a lot as well. It’s definitely one that should be in their collection. Overall the game works well in so many different ways. It’s a lot of fun for me as well as the family. I highly recommend this one. Castle Panic is a light tower defense style game. It doesn’t take a really long time to play. Most game sessions last around 45 minutes. The game scales well from 1 to several players. I especially like the game solo. The artwork is very much rooted in the fantasy genre. The look and feel is great and conveys the theme perfectly. Fans of the Panic series of games should love this one. Tower defense game fans like those players of Plants vs Zombies should enjoy this one as well. It’s really easy to teach and one that works great with families. Solo gamers should definitely include this one into their collection. This game is lots of fun and one that I enjoy in many different ways. I highly recommend this game. It’s a sheer joy. Now get back out to the wall and protect this castle. For more information about this and other great games, please check out Fireside Games at their site. This entry was posted in Reviews and tagged board, board games, card, card games, castle, castle panic, de, fireside, fireside games, games, justin, justin de witt, panic, witt. Bookmark the permalink.